So when fellow film geek Sahil Roy approaches her to direct a movie for the upcoming Summer Festival, Twinkle is all over it. The chance to publicly showcase her voice as a director? Dream come true. The fact that it gets her closer to her longtime crush, Neil Roy, Sahil’s twin brother? Dream come true. When mystery man N begins emailing her, Twinkle is sure it’s Neil, finally ready to begin their happily ever after. The only slightly inconvenient problem is that, in the course of movie making, she’s fallen madly in love with the irresistibly adorkable Sahil. Twinkle soon realizes that resistance is futile. The romance she’s got is not the one she’s scripted. But will it be enough? 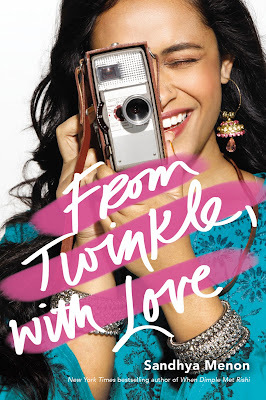 Told through the letters Twinkle writes to her favourite female filmmakers, From Twinkle, with Love navigates big truths about friendship, family, and the unexpected places love can find you. Twinkle Maher is an aspiring director, destined to share the untold stories of the world. As a young Indian American woman of a low socioeconomic status, Twinkle is determined to persevere within the patriarchal dominated society with tenacity. Twinkle is the primary caregiver for her grandmother, her father an aide for displaced adolescents, her mother tormented by undiagnosed depression and unable to return to India. Her grandmother is an inspiring and wonderful support for Twinkle, also offering perspective in the absence of parental influence. I admired her fortitude but Twinkle is often unable to compromise. Whether a necessity for perfection or to control her environment, she describes it as not having her voice heard, often accompanied by feelings of being a woman of colour within a patriarchal system. It intensifies the need to raise marginalised voices but often excuses her demanding behaviour throughout the narrative. Twinkle's journey of realisation is difficult as her popularity cultivates, friendships are constrained as her world becomes increasingly more exclusive, alienating Hannah her childhood companion. Sahil Roy is a film aficionado, a connoisseur of stories told. Dissimilar to sibling Neil, Sahil is an academic who is determined to be recognised for his own achievements. Serendipitously, Twinkle and Sahil collaborate on a film tor the Pikes Peak Charter Midsummer Night, an annual event celebrating cinematography. The tentative companionship is lovely, Sahil encouraging Twinkle foremost as a creative young woman and professionally, financing the film. I appreciated that Sahil was incredibly gentlemanly throughout the process, allowing Twinkle freedom of creativity. Through interactions with friends and an anonymous online journal, Sahil is incredibly attracted to Twinkle. Unfortunately, although Twinkle has developed a fondness for Sahil, she believes Neil Roy is the ideal brother to enhance her social status, unbeknownst to Sahil. The romance is convoluted, tumultuous but entirely authentic as Twinkle discovers Neil represents an ideal, rather than the connection she shares with Sahil. Sandhya Menon is an exceptional author, creating vibrant and diverse characters and beautifully imperfect narratives of adolescent exploration and actualisation. In a series of letters written to accomplished female filmmakers, From Twinkle, With Love will captivate and delight readers until the final page. I'm thrilled you liked this, Kelly. I enjoyed Twinkle's growth and there's just something about girls who aren't always likable that I love. And Sahil! What a sweetheart. I'm looking forward to Sandhya's next impatiently! She's incredible isn't she. I love her perfectly imperfect characters and that she allows them the freedom to make mistakes and learn from their experiences. It's something often missing in young adult. I can't wait to see what she's working on next either! I've heard pretty mixed things about this one. I did enjoy Dimple, but it seems like Twinkle might be a bit harder to like. However, I am happy to see that you enjoyed this one, despite some little qualms here and there. I like the book format - I think books written in letters are fun, and I've always been a fan of unique formatting like that. As a character, she felt the pressure of adolescence very intensely and the need to be accepted by her peers. The journal type letters to her favourite female film makers is such a lovely concept, so many I hadn't heard of before but it was another element of Twinkle being able to connect to other like minded women within a male dominated environment. She's such a wonderful storyteller Ailyn, incredible female characters that are complicated, imperfect and authentic. We need many more diverse, feel great stories in young adult. I love imperfect and even irritating characters that make mistakes, they're much more genuine especially during those adolescent years when we're learning and growing from our experiences. Beautiful and comprehensive review (per usual)! I didn't love this one (3 stars) because I started getting overwhelmed by how much was going on, but I loved Twinkle's relationship with her grandma and how determined (to the point of obsession) Twinkle was. I felt the same about the romance aspect and the secret admirer, it was a little too much and distracted from the narrative. Her grandmother was lovely! I love seeing extended family members in young adult, so many families live with multi generations under the same roof and it's great to see it portrayed in young adult fiction now too. I haven't read either of this author's books but I have a copy of this one! I'm excited to read it because a book about a filmmaker speaks more to me than Dimple and her computer skills, haha. It sounds like this one really tackles when it's like to be a young Indian-American girl in the modern day and I'm excited to read about Twinkle's experience. I'm glad that she realises that connection is a better basis for a relationship than social status! Lovely review, Kell <3 I hope you like the author's next book, too! Me too actually, luckily When Dimple Met Rishi didn't delve into the confusion of coding. I find Twinkle more relatable as a character but her inability to compromise really grated on my nerves at times. I really enjoyed her character development and how she was able to learn from her mistakes. I've been on the fence with this one since it came out. Everyone was talking about it there at the beginning and the hype was smothering me. I like to give popular books a chance to cool off before starting them, and it also gives me time to get a feel for the book. You know how much I value your opinions, so it looks like I'll be leaning more towards reading it than not. I like that was a gentleman and just let her do her thing! Sahil is a wonderful character and although I really enjoyed it overall, I found Twinkle really unlikable at times. It's part of her narrative and character growth but even before her new found popularity influenced how she was treating others, she was unable to compromise and would excuse her behaviour. The supporting characters were quick to condemn her behaviour though which was appreciated. I recently posted how I DNF-ed this book, which was obviously very upsetting because I was so excited for it. I'm glad to see you enjoyed it more than I did. I couldn't get past my issues with Twinkle as a character. She felt very young and I found a lot of her decisions and rationalisations to be too frustrating to allow me to enjoy the book. It was a me issue though, I know plenty of folks really enjoyed it. I can't wait to see more from Menon, though. She writes fantastic books and hopefully the next one will work better for me. I struggled with her as well and I can see why you decided to give it a miss. I was debating whether to but pushed through the issues I had with her character and I'm thankful, it turned out to be quite a lovely read. My biggest issue was her inability to compromise, lecturing others on feminism and her marginalisation as an excuse for her behaviour. Sahil was far more patient and understanding than most. Her work is the kind of pleasure that comes from sitting with a bowl of ice cream after a long time with a book in hand and keeping the world at bay. It truly is and we need those gentle moments. I love her feel great storylines, annoying characters and all. It's just such a lovely change of pace. Oh my gosh. How did I miss the release of this? The 22nd May! Ahhhh I added it to my TBR when I first heard about it last year and yet I dropped the ball. I LOVED When Dimple Met Rishi and was (still am) super excited to meet Twinkle. - Okay calm down Sarah, you’ll get there in the end. She's incredibly frustrating Sarah but I liked how realistically imperfect she is. Especially during those adolescent years, we're usually swept up in our own needs. She matures greatly throughout her journey, you'll really enjoy this one Sarah, such a feel great read. I gotta admit that I was not the biggest fan of When Dimple Met Rishi... The characters just irritated me? I don't know what it was, maybe it was just wayyyy too far from my own life style and I just couldn't relate to it so I could not get into it.. There was just something about it that I couldn't connect with. I did like the writing though so I'll definitely still keep this one on my tbr and give Menon another go. Beautiful review as usual, Kelly! Thank you Lara darling. As characters, I preferred Dimple and Rishi, Sahil is wonderful but it takes quite a while to warm to Twinkle. I liked her journey of realisation but she wasn't able to compromise and I felt she was determined to get her own way and excused her behaviour. Overall it was a great read, I think it'll really surprise you. I've read a few reviews from South Asian bloggers who have really enjoyed it, so it probably depends on their reading preferences too. I'd definitely give them a try, I think they could really surprise you. They're both wonderfully feel great reads. I enjoyed this one but not quite as much as her debut. Same Karen. I enjoyed Dimple more as a character but I liked Twinkle's tenacity but not her inability to compromise. In comparison, both Dimple and Twinkle are quite opposite individuals. Where Dimple had the support of her family, Twinkle really only has her grandmother. It's definitely shaped who Twinkle is as a character and despite how frustrating she was at times, I still really enjoyed seeing her journey. A wonderful read Sophia! Sahil was SUCH a total cutie! I really loved him...although I feel like he deserves better than Twinkle?! Haha. I'm terrible.😂 And I do think I liked Dimple & Rishi better than this, but still am keen to read more from this author! Oh man, the romance drove me crazy here and Twinkle most definitely had her flaws which I found really frustrating. Lovely review Kelly!